A car accident is one of life’s least pleasant experiences. Besides the accident itself, there are often a number of headaches that arise during the process of filing a claim, obtaining damages and getting back on the road. But what if you don’t own the vehicle you were in during the accident? If you are in an accident in a taxi or a Zipcar, two popular types of alternative car transportation, you have options to protect yourself beforehand to make sure you aren’t held liable for more than your insurance covers. 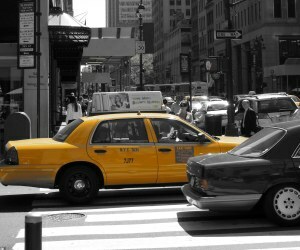 If you are involved in a car accident with a taxi, your legal options are no different than an accident with a typical passenger vehicle. However, the process will likely be different because taxi drivers are often more aggressive in avoiding liability because of the nature of their work. Take Pictures of the Scene—As with any accident, you want to be sure to document the scene of the accident as thoroughly as possible. This means taking as many pictures as you can to use as evidence to protect yourself from liability. This applies if you were the driver or a passenger in a taxi. As a general rule, if you are in an accident, take pictures of the scene. Find Witnesses—Although an accident can be a stressful experience, it is important to do your best to get the names and contact information of as many witnesses as you can. This will help establish liability in the accident and will better protect you. This is an important step to take regardless of your position in the accident (driver or taxi passenger) because it will improve your chances of collecting damages. File a Claim—File a claim as you usually would after getting the taxi driver’s insurance information. This important step does not differ from a typical accident. Car sharing is a relatively new option for drivers who do not wish to own a car, but need transportation occasionally. Zipcar and other services charge a low rate, include gas and insurance, and are more convenient for many city residents. But although Zipcar includes liability insurance, drivers still put themselves at risk every time they use the service because their service covers only $300,000. Serious car accidents can top $300,000 in a hurry. To protect yourself, one option is to contact your insurance provider about non-owner’s auto insurance. This insurance costs significantly less than typical insurance and can add up to $1 million in liability on top of the insurance provided by the car-sharing company. Although the risk of a serious accident is comparatively small (Zipcar claims that 99.3% of liability claims are less than $50,000), a non-owner’s policy can give you peace of mind and protect you in case of an accident where liability can pass the $1 million mark. If you’ve been involved in an automobile accident due to no fault of your own, you may be entitled to compensation for your injuries. Contact the law firm of Bruce A. Hagen to learn about your options in a free consultation. In addition, our firm offers a smartphone app that lets you immediately email all important accident information, such as photos and recordings, directly to the Law Office of Bruce Hagen. It’s convenient and ensures that no details of the accident will be missed. Got a minute? That’s all it takes to download the Hagen app and be ready for any emergency on the road.